In just one month iPodiatrist iPhone App has touched down in every corner of the world bringing the importance of foot health to every inhabited continent on the planet. Dr. Alec Hochstein the "iPodiatrist" has fielded questions from patients, students, and doctors on every one of them, from diabetic footcare to bunions and hammertoes. iPodaitrist was uploaded to the Apple App store just three weeks ago and has been received with tremendous interest. Dr. Alec Hochstein is our friend and forum member and we hope that he will tell us more about his extremely helpful and successful application. Well this was certainly a very nice surprise. I am so glad that the profession has embraced this project of mine. It truly was a labor of love. I thank you for your interest and the many comments and words of encouragement from around the globe. What has been of great interest to me is the amount of people outside of the profession who have downloaded the App and interact with it daily. I knew that those doctors who were already avid iPhone/iPad would certainly try it but, it was very surprising to start hearing from patients, and this truly is an amazing experience. It gives me such pleasure on a daily basis to be able to refer patients to my colleagues, throughout the country. I wrote my first BLog post within iPodiatrist "The Long and Winding Road" outlining how I came to develop the App and I encourage you to read it, sometimes life throws us a curveball, and its up to us to learn how to get a hit or strike out. I love mobile social media, it is the direction the world is heading, we want our information, education, and our interactions with people, now, in the palm of our hands, and that is why I built iPodiatrist. If you are sitting in your chair, at your desk or in your car, with iPodiatrist in your hand, make no mistake, you have the ability to "Speak" to every person who has it on there iPhones and iPads instantaneously, that is a powerful thing, and I am proud to say it is the only avenue in our profession to do that. I welcome everyone of you to reach out to me and your colleagues. If you have a point of view, a rant, a question, a blog post you want to take Global, tell me, and we will tell the world, thats the power iPodiatrist brings to us. Thanks for all of the support kind words and feedback, as well as your suggestions, this has been a great honor for me. If we find ourselves at a conference, meeting, or in the same Starbucks please alert me to it, come over and say hello, I want to meet you. 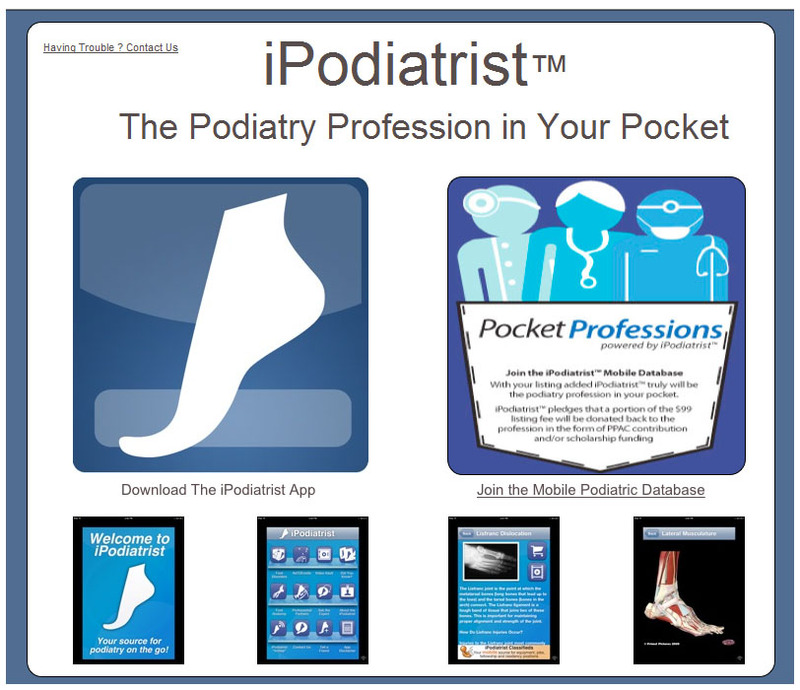 2 users thanked iPodiatrist for this useful post. Thank you Dr. Hochstein for your incredible application! It would be nice to meet at Starbucks one day, but you are in New York, a little far from my location, I'm in AZ. Hopefully we can make it one day. Although the Internet makes all of us much closer. There is a small suggestion. There are a few more smart phone platforms where you application will not work: Blackberry with its OS, Android, Win Phones. Is it in your or someone else plans to build the same application for these smart phones as well to let more people use it and contact to each other? That would be really great! Development on the other mobile platforms is certainly in the works. Honestly the biggest obstacle to that is the development tools available and the cost of such a project it is not as simple as just porting over the code. In addition the functionality of these other devices while excellent for phone calls and business emails, some of them (not All) do not come close to the iOS platform which is just such a natural for this type of application. I wanted to build this app and build it with everything I could put into it for Version 1. As things progress we will certainly by coming to other platforms. I am currently developing another App....YOu are gonna love it!!!! Thanks, I hear AZ is nice. 1 user thanked iPodiatrist for this useful post. I am currently developing another App....You are gonna love it!!!! I hope it will be for Android since I'm using HTC G2. So I cannot test any iPhone apps. Although I could probably use my son's iPod, it has this capability and WiFi. We'll see. Thanks, I hear AZ is nice. Thanks Alec, I will definitely download this application as soon as it's available for Android. Please keep us posted! So I cannot test any iPhone apps. Although I could probably use my son's iPod, it has this capability and WiFi. We'll see. Interesting thread. I like the suggestions of the members. Thanks for sharing this thread with me. For the first time I deleted only your signature with the spam. Next time I will block you, forever.